Coffee Talks and Cat Walks: Hello May! I blinked and it went from April to May in a flash. April was a very busy month, and sadly the ole bloggy-blog-blog didn't get a whole lot of attention. So Yes, its May, but I'm just going to do a quick re-cap on my April adventures. In a nut shell here are some of the festivities that took place in my neck of the woods. Top Left: We ate breakfast a few times at one of our favorites in town, (Cafe Patachou). It's a great way to kick off the weekend - A big breakfast, with a hot cup of joe, while reading the newspaper with my love. 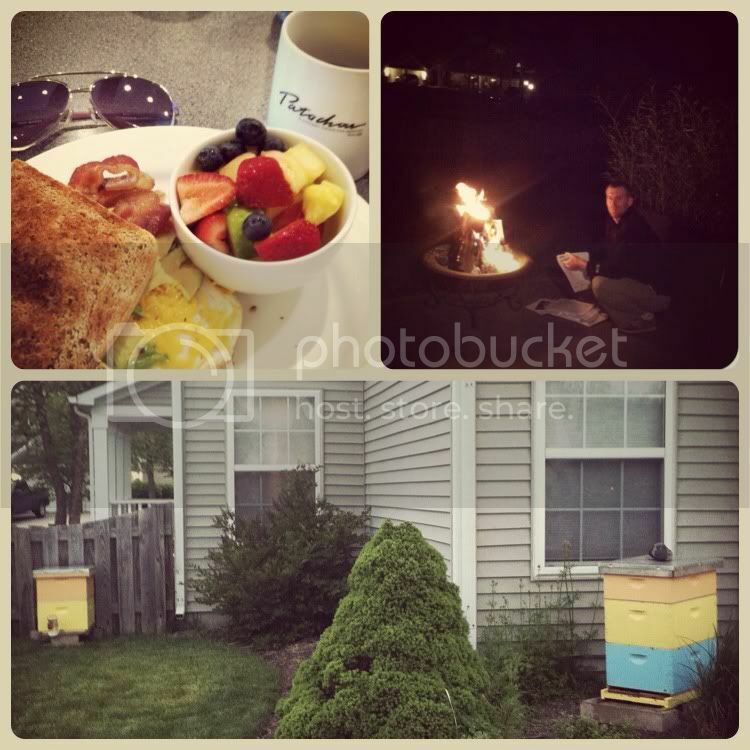 Top Right: We also had some cool evenings so we had a couple of fires in the fire-pit and just relaxed and let go. Bottom Photo: I split my beehive. Still waiting to see how things transpire with the split. I'm crossing my fingers and hoping this year yields a lot of honey. Top Left: We played the lottery for the first time. It was "The Big One"...the mega-million (I think it was called) - No luck. Oh well. Bottom Left: My brother and his family came to visit me while they were on spring break. We had a couple of fun-filled days together....ate out, went to the zoo, went to the park and had a great visit together. I wish I could see my sweet little niece and nephew everyday. They are so much fun to be with. I love them to pieces. 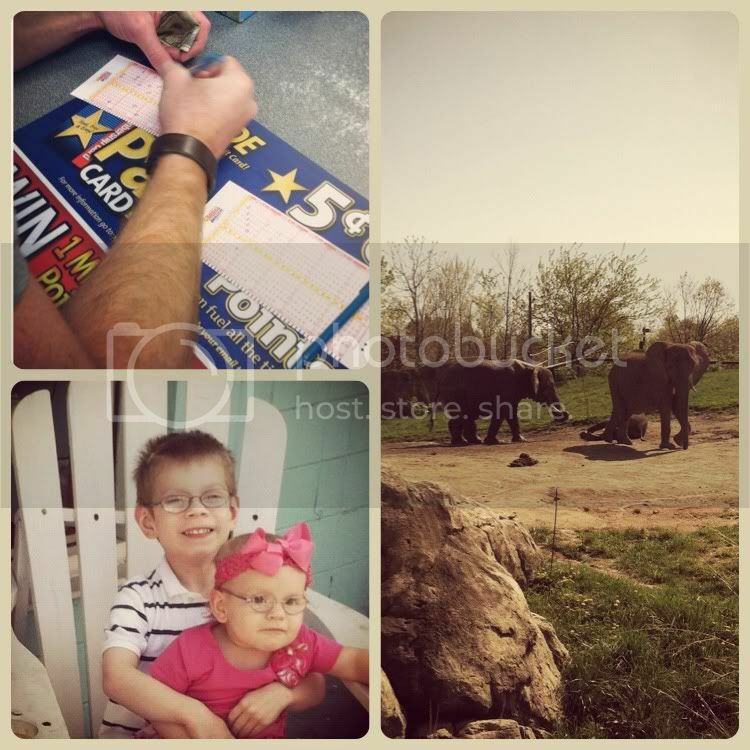 Right Photo: Saw the elephants at the zoo with my brother and his family. There was an adorable baby elephant....so cute and playful! Left Photo: Packing for Vegas. Packing is complicated - I tend to over-pack like most women, but you just never know what you're going to need. I suppose it's better to be over prepared right? 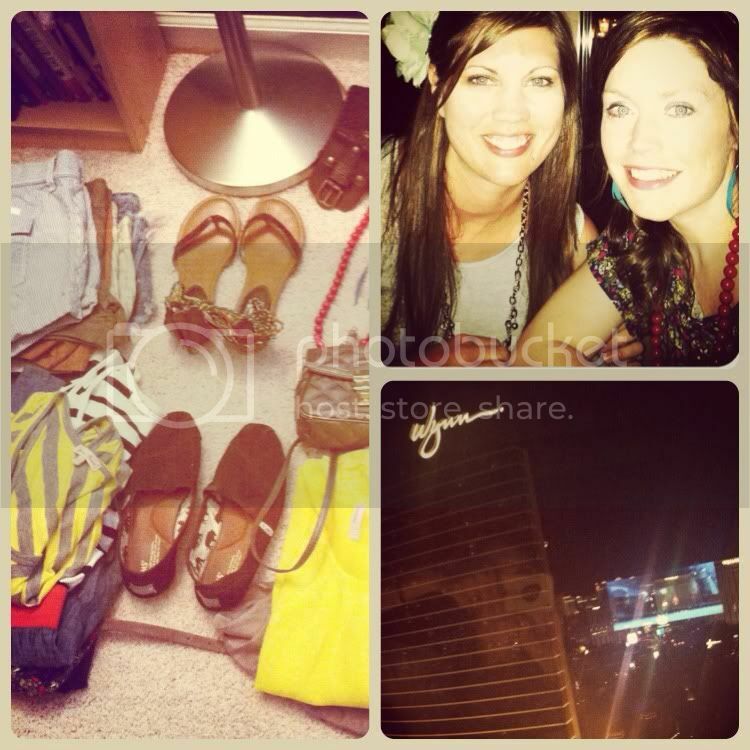 Top Right: Pic of my friend Melissa and I while dining out at Lavo in Vegas. The weather was toasty warm during the day, but gorgeous at night. We dined outside overlooking the Vegas strip. It was fabulous! Bottom Right: View from our room at the Encore - looking out to Wynn & the Vegas Strip. Bottom Left: Took a quick trip back to my hometown in Illinois to visit some friends. I had an amazing time catching up. I just wish I had more time with my girls. Time flies when you're having fun. Saturday morning, my friend Tara introduced us to a fabulous "Farm-to-table" restaurant for breakfast in a nearby town. I had lamb sausage and gravy. It was amazing. After breakfast, my husband and I strolled around the small town and I fell upon this store-front window. The visual merchandiser with-in me was in absolute awe at this image. It was a store that had been untouched for decades. I love treasures like this. My husband and I spent the afternoon stopping at various Antique shops on our journey back home. We each found a couple of things. It's crazy how my taste in fashion and design has evolved over the years. I love getting my hands on fun, old stuff. I never appreciated antiques in the past, but I really dig them now. 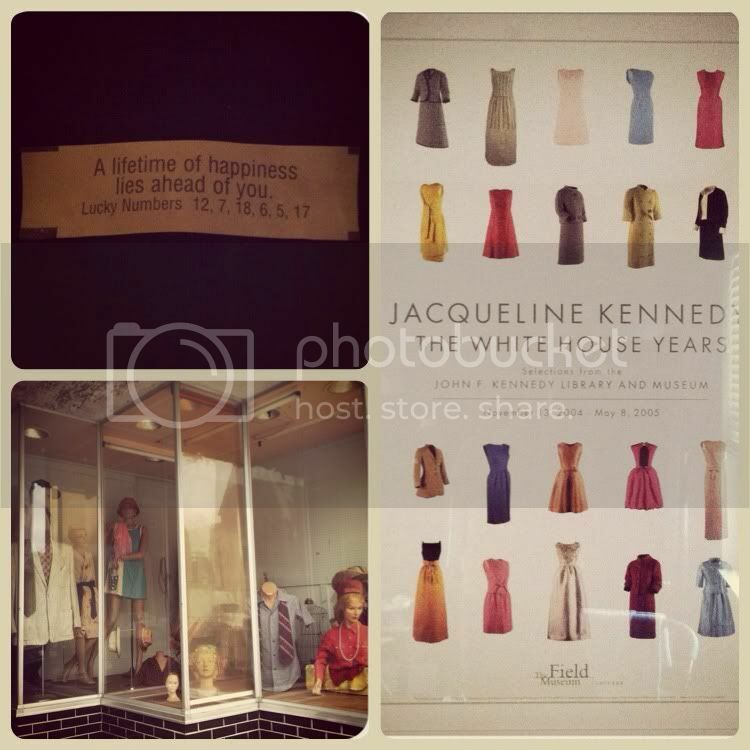 Right Photo: YEARS ago my mom and I went to the Jackie-O exhibit at the Field Museum in Chicago. I bought this poster and have been holding on to it ever since then. I finally got it framed and it's now hanging in my sewing room. I'm not sure what took me so long to frame it. I wish I would've done it a long time ago. I just love it so much and it ties my sewing room together perfectly. I believe "Stunning" was the word I used to describe it when I stepped back and admired it hanging on the wall for the first time. So That's about it. We'll see what May holds. It's already starting off crazy busy. I'm just trying my best to carve out some time for sewing with Silvia my Singer. I want to make sure that I'm fully stocked and readily prepared for my craft show in June.